By comparison, in 1990, the tourism sector had gross revenues of only US$250 million. In 1988, fewer than 300,000 tourists visited Cuba. In 1987, the island accounted for 3% of the tourists visiting Caribbean area countries. In contrast, in 1997, Cuba accounted for 7% of the tourists visiting the Caribbean. 12 According to Vice President Lage, the tourism sector in Cuba grew at an annual rate of 19.3% from 1990 through 1997, compared with 4.3% for the Caribbean area countries as a group. As the largest corporation in the industry and the pioneer of large scale projects in a semi-socialist economic and political regime and an unknown market, Sol Meliá’s performance substantially affects the initiatives of competing corporations. While its success may create an incentive for potential investors, any substantial failure may discourage both potential investors and companies operating on the island. As discussed in the latter part of this paper, an empirical analysis shows that the island has been consistently Sol Meliá’s most profitable market during the last years, and this giant company has proved to be Cuba’s most influential strategic asset in the tourism industry. As early as 1976, the top twenty hotel companies in the world accounted for 67% of the rooms in the Service World International’s top 100 largest chains. The economies of scale afforded by pooled marketing efforts and shared computer reservation system has allowed the leading hotel chains to effectively dominate the market. This rapid growth has been made possible through a flexible ownership and management control system. As in the case of Cuba and its joint ventures, management contracts have become an increasingly popular form of operation since they allow the chains to expand with minimal capital investment, while the owners have the advantages of being part of a larger, standardized, and well-organised chain. Accordingly, the absence of an entrepreneurial class, foreign exchange and skilled labour in the developing world has led to the rapid intrusion of large-scale foreign capital and management in the lodging industry.20 It is in this context that Sol Meliá should be primarily studied. At present, Sol Meliá is ranked 14th in the world international hotel companies.21 Operating 205 buildings with 53,000 rooms (100,000 beds) in 25 countries of four continents, Sol Meliá is the largest hotel corporation in Spain and the third largest in Europe. Over 19 million persons annually stay at hotels. In 1997 the company reported a competitive room occupancy of 71%. Sol Meliá, founded in 1956 by Gabriel Escarrer, its current president, has 21,000 employees and a presence in Europe, America, the Mediterranean Basin and Asian Pacific, through its eight brands: Gran Meliá, Meliá, Meliá Comfort, Sol Ilite, Sol Club, Sol, Sol Inn and Paradisus, covering the different market segments. The company is structured in five independent business areas which have a general management status: European Urban Hotels, European Resort Hotels, America, Cuba and Asian Pacific. Management is organised under five main areas of activity: Economic-Financial, Marketing, Human Resources, Consulting and Systems, and Maintenance. 22 Sol Meliá is also a pioneer in the hotel sector incorporating advanced sales and marketing systems, launching the first loyalty programme in the sector (the Mas card) and signing strategic alliances with other leading companies such as Iberia, Avis and American Express. Latin America: The Latin American region has the second highest estimated growth potential for tourism from 1997 to 2007 according to the World Travel and Tourism Council. The region is a key market for Sol Meliá in terms of fee contribution (around 21% of total fees for 1997), brand recognition, language and culture, and hotel owner relations. It is also the most profitable Division in the Sol Meliá portfolio in terms of GOP26 margins at the hotel level, in fees obtained per hotel or available room, in occupancy-average daily rate (ADR) mix and finally in profitability from investment in minority stakes. According to Oscar Ruiz, Chief Financial Officer, in recent years Sol Meliá has found very attractive acquisition opportunities in Latin America that have not been fully exploited due to the company’s policy not to purchase real estate assets, save for certain minority stakes in hotels. The desire to capitalise on these opportunities is the main reason for the creation of MIA, a subsidiary that will build or acquire hotels that are as profitable as others managed by the corporation. Of the 340 joint ventures currently operating within the island, Sol Meliá manages the largest in the tourism industry and channels substantial foreign capital into Cuba. Although Cubanacán is its largest partner in Cuba, the company also manages three hotels with the Cuban State Gaviota Group.27 In 1997, 56% of Sol Meliá’s hotels in Cuba were located in Varadero, 20% in Holguín, and 24% in Havana. Meliá Cohiba, located in the capital was the most profitable, while Meliá Varadero was the least in 1997. Cuba’s new resorts in 1998, are significant in absolute terms, but small within Sol Meliá’s rapid expansion plans world wide. The investments made throughout 1997 in the Meliá Tulum (Mexico), the 667 rooms/apartments Gran Meliá Caracas complex and the Meliá Sancti Petri amount to 2,324 million pesetas, each of them with an expected rate of return of more than 20%. Of strategic importance has been the management contract signed for the Meliá Bruselas (Brussels), which represents a further step towards the expansion objectives in the main cities of Europe. In the Dominican Republic, the incorporation of the Meliá Santo Domingo and the Meliá Juan Dolio has positioned the company as leader in this important tourist destination.32 In total, the company added 27 hotels globally in 1997, and signed agreements with 12 hotels which are to be added before the end of the year 1998. There are 34 additional signed agreements for hotels to be added in the next three years, and 35 in an advanced stage of negotiation. For 1998, the company believes that general conditions remain positive for the European Resort and City Divisions. 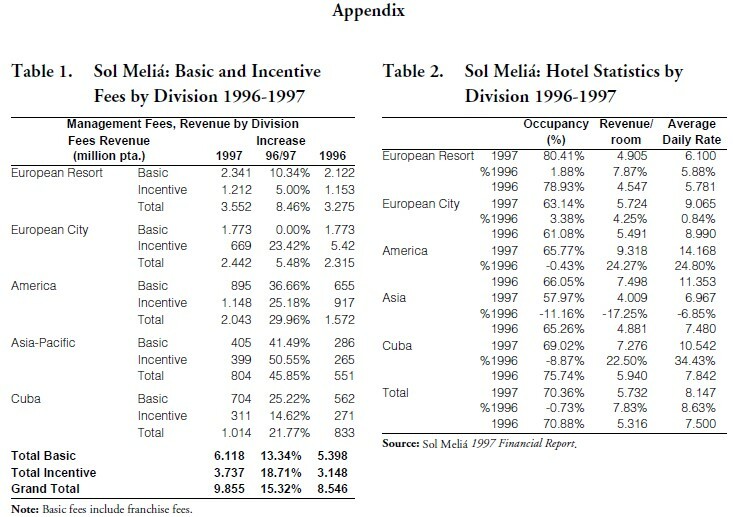 Using data from the latest Company Official Report available (1996), the performance of the Cuban Division of Sol Meliá can be compared with the other four Divisions (European Urban Hotels, European Resort Hotels, America, and Asian Pacific). Despite some fluctuations in total net revenues and low repeat rates, the Cuban Division has been a very profitable market for Sol Meliá. 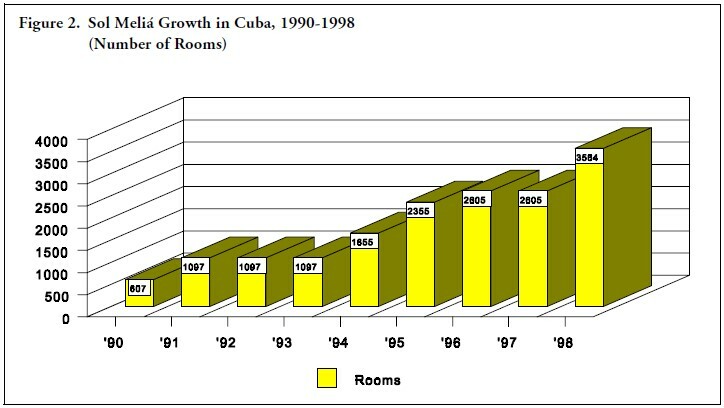 From 1992 to 1995, the overall results of the Cuban resorts were comparatively higher than during the 1996-1997 period. In 1995, the Cuban Division generated 8.1% of all revenues with less than 3% of the company’s facilities. The following year, 1996, the Cuban Division accounted for 9.8% of total revenues with only 3.9% of the global holdings, due mainly to a 33% increase from the previous year in management fees. 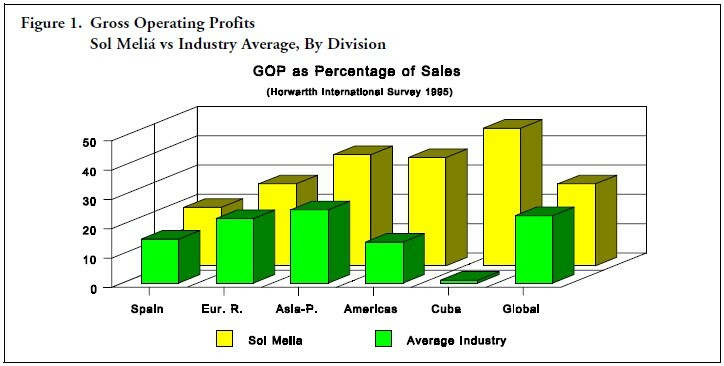 As the figure below shows, no other Division came close to this level of profitability. In 1996, the eight hotels included in the Division registered an average occupancy rate of 75.7% and an average daily rate (ADR) of 7,842 pesetas, generating revenues of 833 million pesetas for Sol Meliá in management services.39 Whether it can be sustained as in other Divisions is a different issue. Profit levels in first three quarters of 1997 were lower in the Cuban Division that in the others mainly due to a low occupancy rate and the negative effect of the rising dollar on the demand for Cuba from European visitors. Instability and uncertainty in profitability levels due to European currency exchange fluctuations vis-a-vis the U.S. dollar may not continue to hinder demand from European visitors after January 1999 when the Euro is expected to replace 11 European currencies. Despite the low returns of the Cuban Divisions in 1997, better results are expected for 1998 as the winter season in the Cuban Division is promising according to the bookings and contracts made to date. To put this into context, the following analysis of the company’s five Divisions may prove helpful. The good performance of the European Resort Division together with the consolidation of leisure and convention activity in several cities in the European City Division have compensated the under-performance of the Cuban and Asian hotels in 1997. According to a company report, the newly added Meliá Las Sirenas and the contribution of Meliá Cohiba have also offset the lagging resorts in Varadero. The negative effect of the rising dollar on the demand for Cuba from European visitors has affected the occupancy rate of the Cuban Division41 which has nevertheless experienced an increase in management fees of nearly 22%. According to company reports, prospects for 1998 also look positive for the European Resort Division in light of the contracts negotiated with tour operators for the coming year, with average increases in prices of 4-5% and greater presence in all feeder markets. The favorable conditions initiated in the second quarter of 1997 in the European City Division seem to be holding for 1998, driven by the buoyant Spanish economy. The economic environment in Asia has affected the performance of this Division, which in spite of this has benefited from an increase in management fees of 46% thanks to the contribution of the Gran Meliá Jakarta, added in the second half of 1996, and the Meliá Bali, which was closed the first three months of 1996 for refurbishment. Although the impact of the financial crisis in Asia was not very detrimental in terms of fee generation until the fourth quarter of 1997, such effects in 1998 must be closely followed. The performance of the Americas Division has been considered satisfactory by the company’s standards, with an increase in fees of 30% helped by the prosperity of the Latin American economies and the effect of the management contracts added in 1996 and 1997 in this Division, about 39% of the total. The Americas Division’s prospects are very promising not only from an operational point of view but also from an expansionary point of view thanks to MIA, although the effects will not be fully evident until the year 1999. Sol Meliá, together with Inmotel Inversiones and the Escarrer family, has recently founded a company whose main activities are centred on the ownership of hotels in Latin America and the Caribbean (not including Cuba). The management contracts that this new structure will provide Sol Meliá are intended to be as profitable as the first 15 most profitable management contracts in the company’s portfolio. Sol Meliá’s alliance with Cuba’s Cubanacán is not a unique condition of the Cuban Division, as it is often thought given the legal constrains and peculiarities of the Cuban market. Sol Meliá’s business strategy relies often on strategic alliances and joint ventures with other market leading companies. Globally the company has formed alliances with suppliers, tour operators, travel agencies, hotel owners, financial institutions, real estate developers and other hotel companies, whenever mutual benefits can be obtained from synergy and the globalization of the activities. For example, of the 41 hotels that joined Sol Meliá in 1996, 26 arrived through management agreements, 14 through franchise agreements and 1 through a commercial alliance; 17 of these 41 were in the form of joint ventures. Cubanacán was formed after the Cuban government dismantled the Instituto Nacional del Turismo (INTUR), the monolithic, inefficient, bureaucratic state organization which was in charge of the island’s tourism since 1959. Grupo Cubanacán is an entrepreneurial holding company in the field of tourism and trade. Some of its facilities are marketed through joint ventures and other trading companies. It employs over 20,000 workers in the hotel industry, trade and services to tourists, while Sol Meliá employed 21,000 (December 1996). • a Conference Center at Varadero beach. Cubanacán’s strong position has allowed the development of another sector which is increasingly strengthening in the Caribbean: businesses and financing facilities to other economic sectors in Cuba and abroad. In pursuing this objective, the Group has set up nine business associations with important foreign enterprises. The Cuban Ministry of Tourism expects growth for this Group to reach a total of 5,500 rooms by the year 2000, of which over 2000 rooms will be located in Havana and around 1300 rooms at Varadero Beach. Such growth will further strengthen the role of Grupo Cubanacán as leader in the field of tourism in Cuba.43 Even though Sol Meliá has recently signed additional management agreements with Gaviota and other Cuban government tourism entities, Cubanacán’s dominance of most of the island’s four and five-star hotels will constrain the Spanish giant to limit the scope of joint venture agreements. A few significant conclusions may be drawn from this analysis. Despite general structural and sectorial deficiencies, Sol Meliá’s financial reports indicate that the company has been relatively successful in obtaining substantial profits from management fees in Cuba. Sol Meliá’s financial success in Cuba, its considerable consistency in channelling investment into the industry, and the recent increase in management contracts with its Cuban counterparts—reaching 11 in 1998—have shown the potential of the island for investment in the tourist sector. Due to the adverse, current political externalities, this potential seems limited to large multinationals which can manoeuvre the financial and commercial obstacles created by U.S. foreign policy towards Cuba. The island has been able to benefit from an experienced management company. Sol Meliá’s regional operational success from 1990 to 1996 was due mainly to lack of competition in the market, which is guaranteed by the structural and operational inability of the Cuban Ministry of Tourism to create competing enterprises on the island. Similarly, these characteristics have been a major incentive for Sol Meliá and other companies to become pioneers in an uncertain and unknown market, handicapped by macroeconomic inefficiencies and socialist management policies. While Cuba has been relatively successful in attracting a large low-budget segment of European tourists, the island has become increasingly vulnerable to the strength of the U.S. dollar. 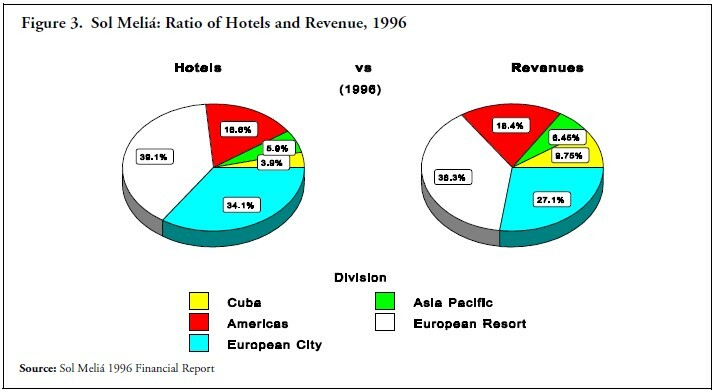 This problem, however, is also reflected in the other Caribbean destination that are direct Cuban competitors (e.g., Isla Margarita and Dominican Republic).44 This trend in Cuba was clearly illustrated by the poor performance of Sol Meliá’s hotels in Varadero in 1997. Joint efforts between the Cuban Ministry of Tourism and Sol Meliá’s marketing strategy to increase demand from Canada and Latin America may produce more favorable results in 1998 and subsequent years. Despite these drawbacks, the company has the ability to compensate from more stable markets in other parts of the island. Hence, aided by consistent increases in revenue from management fees, Sol Meliá continues to profit from its operation on the island. 1. The author would like to thank Lawrence Whitehead, Carmelo Mesa-Lago, Jorge Pérez-López, and Nicolás Crespo for their comments and suggestions, and Sol Meliá for providing Annual Financial Reports and documents. This paper presents the author’s personal opinion. Comments and suggestions are very welcome. 2. In fact, sugar exports were second to nickel with a total US$1.350 billion in 1996, compared to US$971 million, both on an fob basis (EIU Country Report 1st quarter 1998, p. 6). 3. Not in any order of importance. 4. Françoise. L. Simon, “Tourism Development in Transition Economies: The Cuban Case,” The Columbia Journal of World Business, Vol. 30, No. 1 (Spring 1995), p. 27. 5. Sectors not directly associated with tourism. Growth, however, has been based on a large import component. 6. In 1997, 99% of passengers from international flights, and 31% of all domestic travelers were tourists. 7. Of which 92% was in hard currency. 8. Iraida Calzadilla Rodríguez, “El turismo es el corazón de la economía,” Granma (28 February 1998), p. 3. 9. Simon, “Tourism Development,” p. 30. Cuban officials recently reported that 38% of gross revenue in 1997 was net profit. Reuters News Report (11 May 1998). 10. Minister C. Lage, stated: “Yo no diría que el turismo es uno de los sectores más importantes, el turismo es el corazón de la economía.” See Calzadilla Rodríguez, “El turismo,” p. 3. 11. Economic Eye on Cuba, (23 February-1 March 1998). 12. Notice that Cuba’s 1.17 million tourists in 1997 do not represent a very sizeable percentage of the total 18 million visitors to the Caribbean during that year; however, comparatively, it is a substantial achievement for a crippled economy developing its tourism industry during the last 6 years. 13. EIU Country Report, 1st quarter 1998, p. 22. 14. Economic Eye on Cuba (23 February-1 March 1998). 16. More realistic estimates foresee a more conservative figure. 17. To insure the safety and security of individuals, the names of employees are not disclosed in this essay. 18. Sol Meliá 1996 Management Report, p. 76. 19. The Spanish corporation maintains that its present operation and expansion in Cuba do not contravene the U.S. Helms-Burton law, which seeks to punish foreign companies investing in property confiscated after the 1959 revolution. See “Spain’s Sol Meliá Expanding Hotel Chain in Cuba,” Reuters, Havana, (April 9, 1998), http://www.netpoint.net/~CubaNet. 20. See Keith G Debbage, “Oligopoly and the Resort Cycle in the Bahamas,” Annals of Tourism Research (1990), pp. 513-527. 21. According to U.S. magazine Hotels. See Luz Marina Fornieles, “The Privilege of Being Pioneers,” Cuban Foreign Trade, No.2 (1997), p. 5. 22. Sol Meliá was founding member of the Quality Management Club and received the 1993 Principe Felipe Prize for Business Excellence. At the European level, it was the first hotel company to obtain ISO 9002 Certification for hotel management services in its eight brands and, at the national level, the Meliá Lebreros in Seville was the first hotel to receive the ISO 9000 Quality Certificate. 23. 5,723 million pesetas (US$1=153.8 pta). 25. See Sol Meliá, Annual Report 1996 and “Sol Meliá: Profile as a World Leader,” (April, 1998). See www.solMeliá.es. 27. Sol Río de Mares, in Holguín with 238 rooms; Sol Club Río de Luna also in Holguín with 218 rooms, and Sol Club Las Sirenas in Varadero with 250 rooms. 29. “Spain’s Sol Meliá Expanding Hotel Chain in Cuba,” Reuters, Havana (April 9, 1998), www.netpoint.net/~CubaNet. 30. Prensa Latina, La Habana (8 April 1998), www.sol Meliá.es. 31. Emily Valere, “Cuba Sees Tourism Doubling by 2000,” Bloomberg, Port-of-Spain, Trinidad. (13 May 1998). 32. Sol Meliá, letter from the Chief Financial Officer, 1997. 33. Currently, Gabriel Canaves Picornell is the Director of the Cuban Division. Sol Meliá, 1996 Annual Report. 34. Simon, “Tourism Development,” p. 35. 35. Most crimes committed against tourists, however, are property thefts committed when the tourists leave their items unattended. Cuban authorities have recently created a Special Unit for Crimes Committed Against the Tourist. Source: Author’s interviews with policemen on the island in 1996 and 1997. 36. Source: Author’s interview with 3 middle-level managers in Varadero, 1997 and 1998. 37. Simon, “Tourism Development.” p. 37. 38. Sol Palmeras Varadero: Occupancy rate in September 48.89%, October 27.85%, November 24.39%. Source: Sol Palmeras’ Booking Mensual Cristalizado, September-November, 1997 (unpublished). 39. Sol Meliá 1996 Annual Report, pp.15-16. See the Appendix for full data. 40. See Unidad Magazine, Servicios Integrales de Turismo, S.A., 1997. 41. In 1997 the occupancy rate fell to 69.2% from 75% in 1996; however revenue per available room (REVPAR) and ADR increased substantially. See the Appendix. 42. Cuban Ministry of Tourism; Cubanacán website, www.Cubanacan.cu. 44. In March 1998, for example, there were independent hotels in the East and South coasts of the Dominican Republic selling all inclusive packages at $18-$25 per day. The independent hotels (not chain affiliated) are the first to suffer when the dollar strengthens in Europe.